But Pete was not at my door. Instead, I was greeted by pouring rain, thunder and lightning. That’s ok! Rain is good, and thunderstorms are even better because they are rumored to bring sharks out! 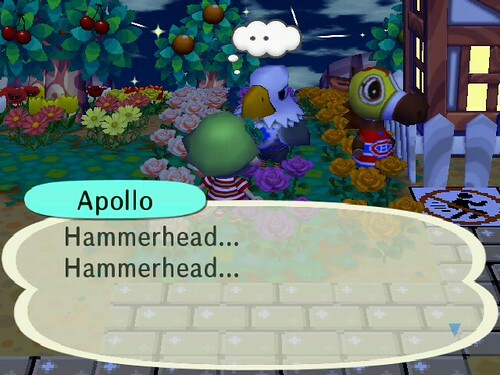 I’ve already got Apollo praying for our town to be visited by a few Hammerheads. 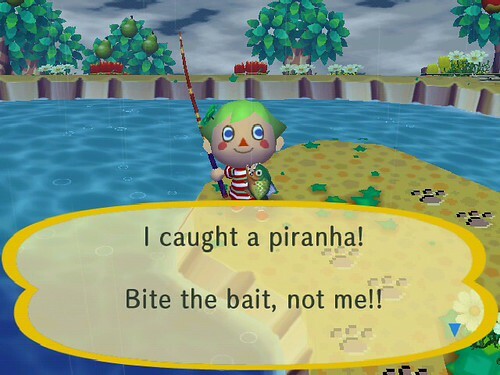 I haven’t caught one yet, so hopefully the thunderstorm will last until tonight when I try again! Finally! I’d just like to mention that when I was playing as Deb, I used a Silver Rod and pressed A like I normally do and had no problems catching it. Deb donated the piranha to the Museum, so Squirt just needed the piranha for his Fish Index! I want to earn a legitimate set of Gold Tools, so I have to catch every fish and bug in the game! As I was walking around triumphantly, I saw Saharah wandering around town. 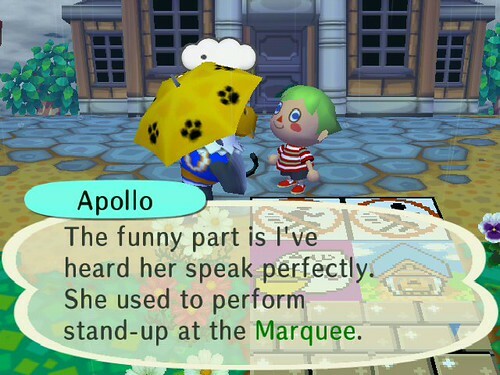 Apollo is an “older” townie, so he seems to know about Saharah’s younger days. You can imagine how hard it was not to laugh, and instead politely tell him “I see…” to confirm that I did not mind that he was going. I also enlisted all my Shaolin characters to also give him the same pep talk. Curly will be gone within the week, I’d guess! HUZZAH!!! No more swine flu for me! With my luck though, some new townie will move right into the same spot where his house was lol! 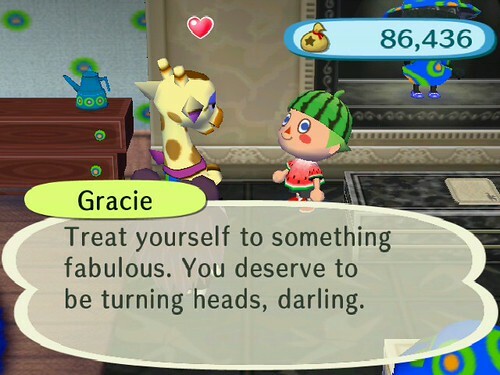 I heard from Vella that Gracie herself was in her store GracieGrace in the city. Since it’s Wednesday I was planning to take the Basu (that’s “bus” in Japanese, I’m trying to learn how to speak it hehe!) to check out Redd’s new inventory. I ignored Kapp’n as best I could, he’s the most annoying driver! I went straight to GracieGrace and peeked at the back of the store. Gasp, she was there! I ran back out to prepare for my evaluation. Since I had discovered fashion styles, I had an outfit planned that was fool-proof. My watermelon costume has a “funky” style, so I had a “funky” hairdo to match. My shoes were red. It HAD to work! I also grabbed my Gold Card from Lloid’s Checkroom at the Auction House, since I was planning to buy the entire Gracie set if I passed my review. And good news, it worked! I was very proud as I bought every last piece of furniture in the boutique. I’m sure animals were staring as I walked with my pockets full of expensive wares and went straight for the “bad side” of the city, Crazy Redd’s alley. He had a Proper Painting for sale (I don’t even look at the other items he sells, since I have them all catalogued already!) so I snatched it up, even though Ruby had warned me about buying paintings this morning. I was too happy about all the great luck I’ve been having today (thanks to my lucky four leaf clover, I’m guessing!) 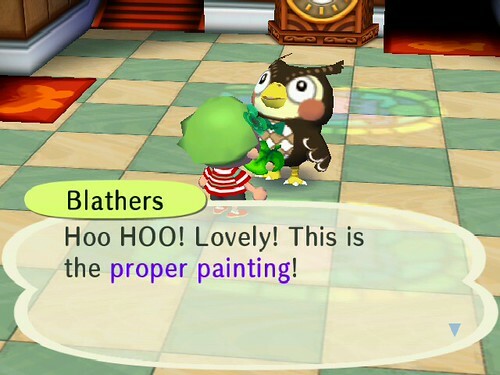 and took the painting straight to Blathers. Wow! Now I only need four more paintings to complete my Art section of the Museum! Sweet! I need a lucky clover! I caught a hammerhead but the piranha still eludes me. Stupid Comcast accidentally cut us off for almost a week! We finally got back on a couple of days ago. 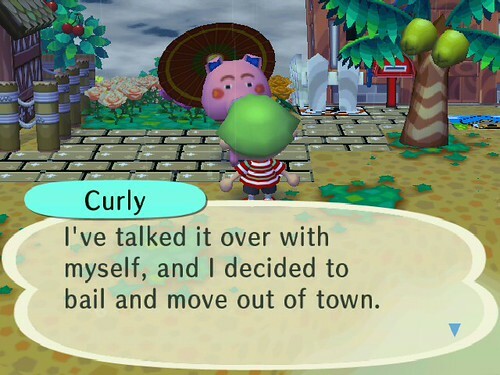 Also I shot down Gulliver but forgot to deliver his part because of stupid RL stuff (like eating). Doh! Perhaps I should wear my lucky clover to try mu luck catching some rare bugs.